Is this your first track day ever? Or your hundredth? Either way Femmewalla is definitely one of the more unique track days you will ever attend! Read below to learn why. One of the favorite activities of the day at Femmewalla is our raffle dinner! All attendees gather in the event space for a much needed hot meal after riding all day, and then the raffle commences! Featuring raffle prizes from our generous sponsors- from free track days, helmets, to generators you can truly WIN BIG at the Femmewalla raffle! Femmewalla Track Day is your chance to meet and spend quality time with some of the most amazing women in racing! International pro racer Melissa Paris is on the Femmewalla staff and joins us every year to help make your day great, and we have also seen racers such as Patricia Fernandez, Caroline Olsen, and others join in on the fun! Another huge benefit to the Femmewalla Track Day is our unique trackside services that you won't find all at one single track day elsewhere! 2-up rides with Jason Pridmore, one-on-one video instruction with Dale Kieffer, suspension st-up and tuning with Paradigm Racing, photos by Caliphotography and so much more! Please visit our SERVICES page for pricing and details. 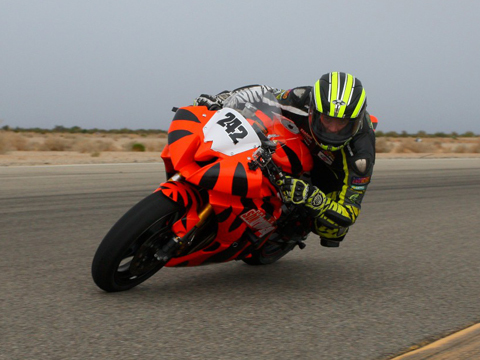 We are proud to offer a women's only track day that truly caters to the needs of every skill-level rider. Whether it's your first time on the track, or you're an expert level club racer, we've got something for you! Bring your own tent and camp out! If it is cold we can offer some sleeping arrangements in the community classroom area. Please send us a note if you are considering this option. Yes, CVR has a snack shop offering a variety of hot and cold options along with snacks and beverages. One ticket to our raffle dinner is included with every registered rider. You can buy additional dinner tickets during the registration process if you plan on bringing any additional friends. You are of course also welcome to pack your coolers and bring along any food/beverages you wish to enjoy during the trackday. Can I bring my husband/boyfriend/ male friend? Yes! Our male friends are welcome to attend but they are barred from participating in any track, riding, or raffle activities. They can be there as your pit crew, moral support, umbrella boy, etc. Also, all Femmewalla riders do not pay a gate fee but any extra pit crew you bring will need to pay the $10 gate fee at CVR. Don’t worry, if they want to do some riding too we highly recommend they sign up for the Socal Track Days events taking place the Saturday/Sunday immediately following Femmewalla. Can I bring my doggy? Yes! We love doggies! Please be aware that the track can be a stressful environment for some pets, please only bring your pet if you are confident they can handle the sensory overload of the track and you keep them on a leash at all times. You must abide by all track rules involving pets. Please see CVR website for more information. How do I track prep my motorcycle? Please visit our PREP page for more information on track prepping your bike. What gear is required to ride on the track? Please visit our PREP page for more information on required gear for track riding. What other items might I need? Please visit our PREP page for more information about setting up your pit space. I don’t have all the gear required, what can I do? Post up on our Facebook page! We have had very generous Femmewalla riders happily lend leathers/gloves/boots etc to riders in need. You may also inquire about gear rentals from JP43 on their website.